The Open Destinations’ London team has made a donation of £1216 to the UK’s national charity for homeless people, Crisis. The money was raised through a charity raffle held at our annual Christmas party in November last year. Guests to the event included staff from Open Destinations’ offices in London and Goa as well as their families. Last year Crisis helped more than 11,000 people on their journey out of homelessness. Up for grabs in the raffle were a total of 20 prizes donated predominately by members of Open Destinations’ senior management team. Amongst the top billed items up for grabs were two pairs of football tickets to watch Arsenal play Tottenham Hotspur in the North London Derby; afternoon tea with panoramic views of London at the Vertigo 42 champagne bar; an extra day of annual leave; and a hospitality match ticket for the Cricket World Cup game at Lord’s between Pakistan and South Africa. Raffle prizes included Arsenal tickets, Cricket World Cup tickets and a sky high afternoon tea for two. Crisis work directly with thousands of homeless people every year. They provide vital help so that people can rebuild their lives and are supported out of homelessness for good. Crisis offer one to one support, advice and courses for homeless people in 12 areas across England, Scotland and Wales. How Crisis help someone depends on their individual needs and situation. It could be with finding a home and settling in, getting new skills and finding a job, or help with their health and wellbeing. They use research to find out how best to improve our services, but also to find wider solutions to homelessness. Together with homeless people and Crisis supporters, Crisis campaign for the changes needed to end homelessness for good. 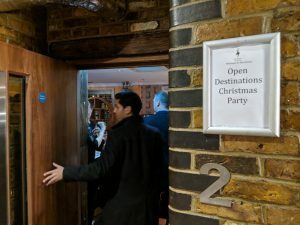 The charity raffle was held at Open Destinations’ Christmas party. You can join Open Destinations in making a donation to Crisis by clicking the button below.